Ok. I’m going to need some help from all you super-smart collectors out there. Every week I receive questions from people. Some of these questions can be answered quickly, while others need more thought and can be turned into a blog post. 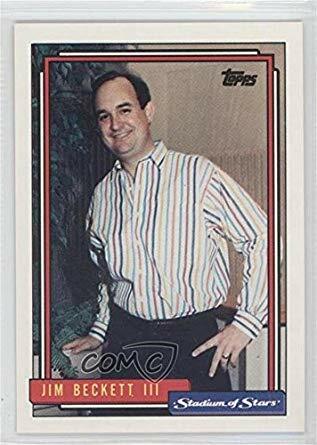 I recently received a question about some uncut, unfinished, and unreleased Fleer cards that an individual has in their possession. This person was looking for a value. When it comes to cards like this, its very difficult to put a dollar amount on them. Basically, they’re worth whatever someone is willing to pay. One of two things will happen. First, collectors won’t want anything to do with them. Second, collectors will go nuts for them. Its very hit or miss. While talking with this individual, I came to find out he worked at the press where these cards were being printed/finished. By the looks of it, people would slip him items for his own collection every now and then. Very cool, and certainly not the only time and place this has happened. The first treasure he showed me is this 2003 Fleer Showcase Football Avant Card uncut sheet. 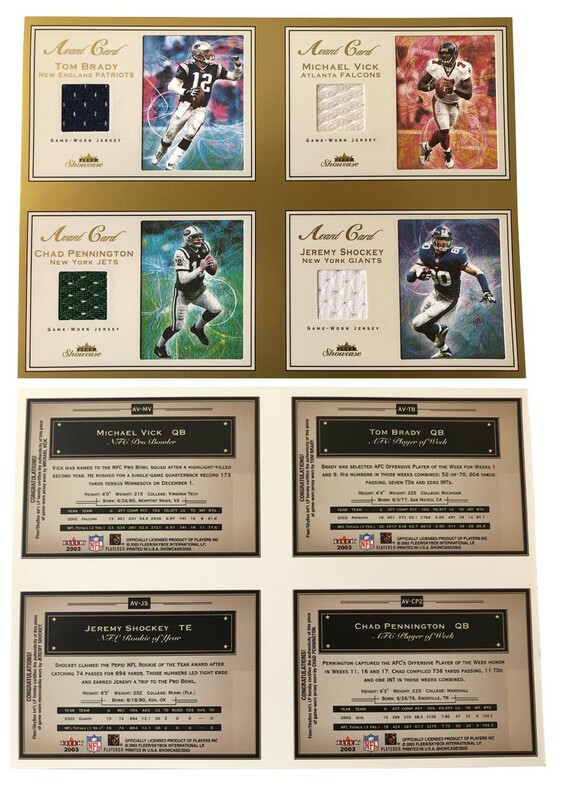 It contains jersey cards of Tom Brady, Michael Vick, Chad Pennington, and Jeremy Shockey. Not only are they uncut, but they’re missing the serial numbers as well. Another thing that stands out to me are the borders. From what I can find, jersey cards from this specific set did not have gold borders. Only silver. Its possible the printing process wasn’t over yet before this sheet “fell off the truck.” The hot stamp would’ve been another process. According to my guy, these cards came from finishers who would add the foil, embossing, and die-cutting. The borders are done in ink, not foil. PMS 871 Gold Metallic Ink to be exact. Next up we have three batches of cards. Starting in the upper left corner we have a 3-card uncut sheet from 2003 Fleer Avant Baseball. The players are Craig Biggio, Garret Anderson, and Pedro Martinez. I think these look like standard base cards, but the owner calls them “die-cut frame cards w/ gold metallic ink.” Printing lingo. In the upper right corner is a 4-card uncut sheet of basketball cards from 2004-05 Fleer SkyBox NBA Hoops. Antawn Jamison, Allan Houston, Ray Allen, and Clifford Robinson make up the sheet. On the front of each card is a gold dot. I have zero clue as to what that dot was used for. None of the parallels I’ve seen for that base set have a dot there. Lastly, there are some Legendary Foils cards. I’ve never heard of these, but I highly doubt they have anything to do with Fleer. Most likely they were printed/finished in the same facility. Honus Wagner, Babe Ruth, and Roberto Clemente are in this lot. None of them have backs. In my research, they seem to have been released in 1993. I’d put them in the same class as those mass-produced, embossed, gold cards that almost nobody wants. Part of the Bertelsmann Printing Group, Dynamic Graphics from Horsham, PA is where they originated from. The company is still operating today. Anymore thoughts about these cards are gladly welcomed. Q&A: Did Topps Issue Boxes Of 1992 Stadium of Stars Cards? Question: Hi! I came across this odd card of Larry King. It appears to be from 1992 Topps Stadium of Stars. Did Topps issue boxes for this set? What can you tell me about it? Answer: No. Topps did not issue these in the traditional box format. 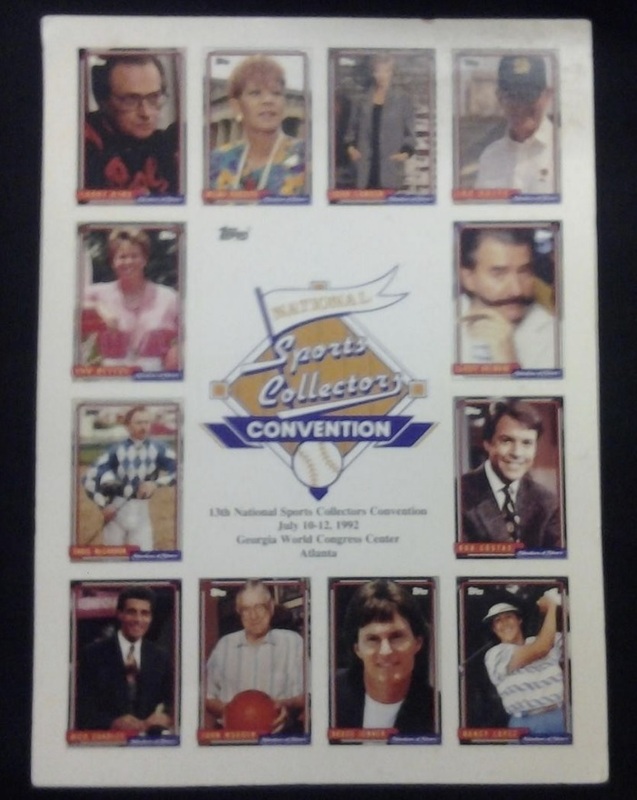 The year was 1992, and the 13th National Sports Collectors Convention was being held in Atlanta, GA. For the first time in it’s thirteen year existence, Topps decided to setup a booth. Used as a promotional giveaway, Topps created a 13-card set entitled Stadium of Stars. The exact number of cards handed out during the show is unknown. Every celebrity on the checklist received (500) copies to hand out at their discretion. Two jumbo-size cards were also printed for each individual. One was given to the celebrity, and the other was autographed. The signed version was auctioned off, and the money went to a specific charity chosen by that celebrity. Topps sold 5,000 uncut sheets to dealers at the show. From time to time one of those will popup. I believe Jim Beckett III was a late addition and/or had to be obtained differently compared to the others. You can find his single card on the secondary market, but its not pictured on any of the promotional material like the uncut sheet. An oversize souvenir sheet featuring these cards is suppose to be floating around too. A complete set is worth about $30-$50. Q&A – Does Donald Trump Have A Rookie Card? Question: Hi! I’m looking for a gag gift for my friend. Could you tell me if Donald Trump has a rookie card? Thanks. Answer: Love him or hate him. Donald Trump is the 45th President of the United States. One thing is for certain. His presidency will be studied, investigated, and talked about long after he’s out of the White House. Will that talk be good or bad? That’s totally up to you and your political views. Yes. Donald Trump does have a rookie card. During the late 80s and early 90s, Eclipse Comics issued a handful of non-fiction, non-sports related card sets. These sets cover all kinds of subjects like the Savings and Loan crisis, Iran-Contra scandal, AIDS, and the Kennedy Assassination. In 1989, Eclipse Comics released a set titled Rotten to the Core. This 36-card set covers the best and worst of New York City’s politics. 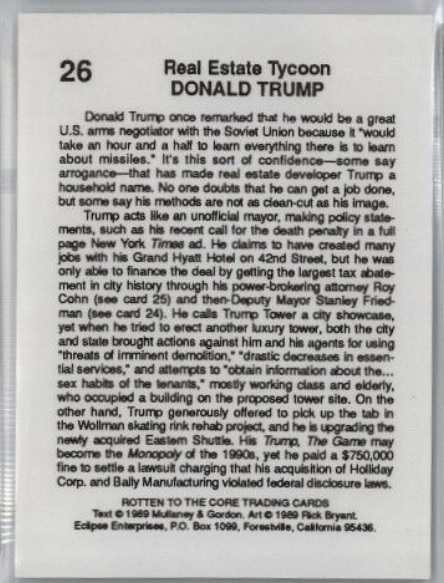 Card #26 is of Donald Trump. Its widely accepted as his rookie card. The card’s back goes into lots of details about his dealings at the time. Quite the entertaining read. Raw copies sell for $20. Gem Mint 10s have reached $100. Q&A – What Can You Tell Me About This Danny DeVito Autograph? Question: I know this isn’t a sports card, but what can you tell me about this Danny DeVito autograph? Answer: Cool card! In 1992, Danny DeVito portrayed the Penguin in Tim Burton’s Batman Returns. As a child, this was one of the movies I watched all the time. For a film that was marketed towards kids, its quite dark. That scene near the end where Penguin slowly walks out of the water bleeding to death sparked the attention of many parents. I thought it was awesome. Things like that are one of the reasons why the studio decided to go in a different direction for the next two films. Batman Forever and Batman & Robin were fun to watch as a kid, but I can’t watch them today. In my opinion, Batman and Batman Returns still hold up for me now. Topps created a few different sets to go along with Batman Returns. One of them being a Stadium Club set. The unsigned version of this card originated from the Stadium Club set, but not the card containing Danny DeVito’s signature. In 1993, Topps issued two sets based on Batman: The Animated Series. They were split up between Series 1 and Series 2. Despite not having anything to do with the cartoon, Topps randomly inserted these Danny DeVito autographs into Series 2 packs. 2,000 copies of his Batman Returns base card were signed. I wish this card had some type of notation, foil stamp, or serial number printed on it. Even though Danny DeVito has a complex signature, an unsigned base card and silver pen are all a scammer would need to attempt at making a counterfeit. I think they’re a hard sell because of that fact. An asking price for an example deemed authentic can be up to $250. Its a great example of an early buyback autograph. 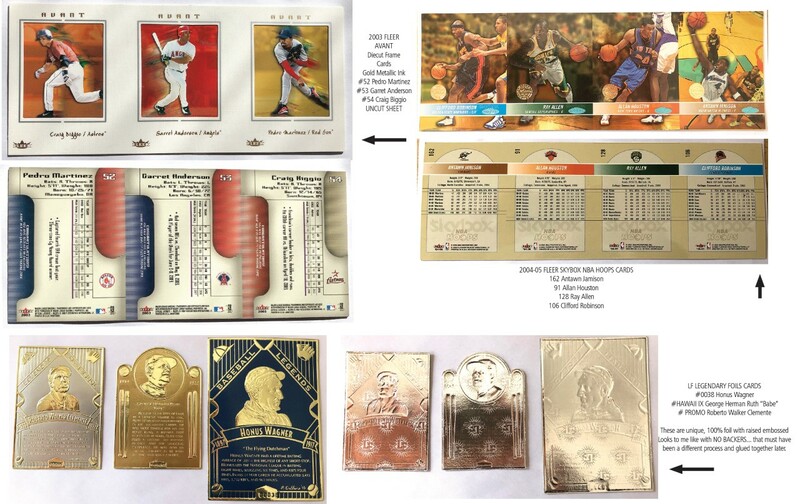 Question: Hi Sports Card Info! Great site! I need some help. 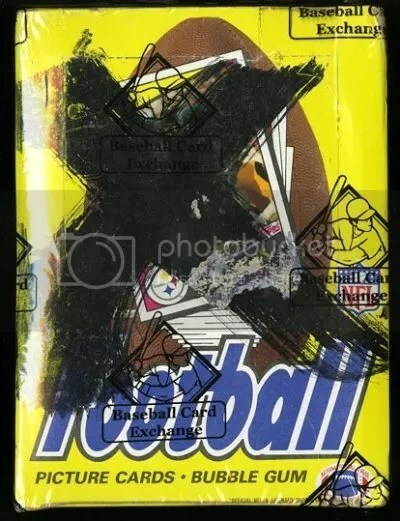 Could you please tell me where this Ken Griffey, Jr. 1999 Fleer Tradition card is from? It looks just like the base, but the card numbering is different? It doesn’t match up with anything on the checklist. Have I stumbled across a rare find? Is there only six copies of this card? Thanks. Answer: Good question. That specific card and five others did not come out of the typical 1999 Fleer Tradition baseball set. Spectra Star, a division of Toy Biz which was owned by Marvel at the time, made a series of six baseball card themed kid’s toy kites. The kites resemble base cards from 1999 Fleer Tradition. Each kite came packaged with an accompanying card. You’re correct. The only difference between the regular cards and the ones included with the kites is the card numbering. 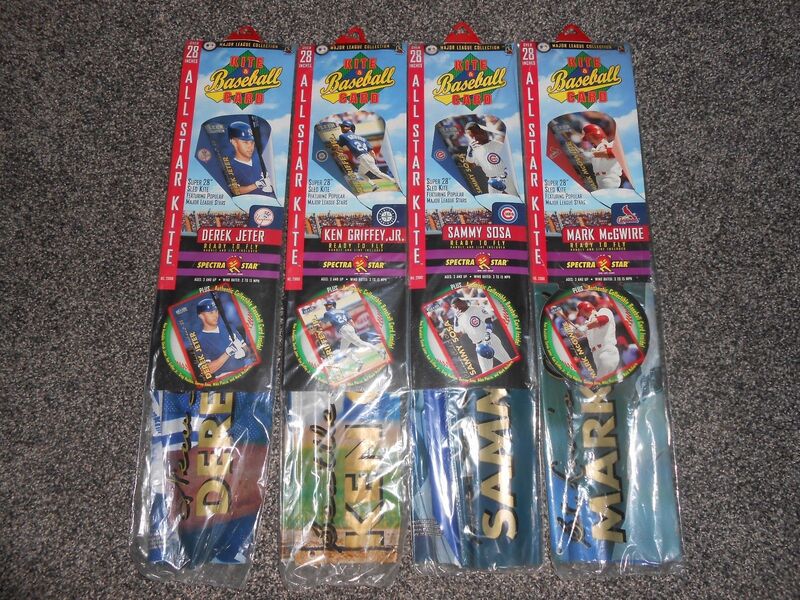 Kites of Derek Jeter, Ken Griffey, Jr., Greg Maddux, Sammy Sosa, Mike Piazza, and Mark McGwire were made. Many of these kites were sold. The “3 OF 6” refers to Ken Griffey, Jr. being #3 in the set of six. It has nothing to do with the amount of copies printed. 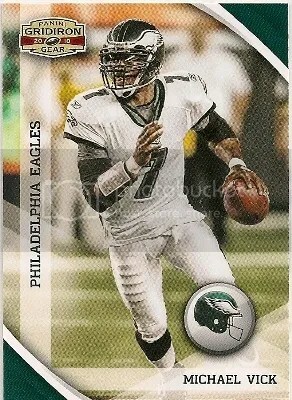 Q & A – Is This Michael Vick Card An Error? Errors have been around ever since the first cards were produced back in the 19th century. Some are collectible, and others people don’t care about one bit. I’m sorry to say the question I received today from a reader deals in the category of ones people probably don’t care about. Here we have a standard Michael Vick 2010 Gridiron Gear base card #115. Nothing too special about the front. Now lets take a zoomed in look at the back side. Notice anything? I don’t recall Michael Vick ever playing for the Vikings. To answer the reader’s question. Yes, this is an error. Is it one that will make this one cent base card worth a million bucks? No. Perhaps if this were the 1980’s, and Panini had stopped production to issue a correction. Then we might have something. But its not the ’80’s anymore.